Home Featured Articles Clash Royal Clan Wars – Brilliance or B.S.?! I love playing Clash Royale during down times … like when my wife drags me to the Garden Nursery. Matches are quick, like games of speed chess. You only need 4 minutes or so to complete a quick game against an equally matched, live opponent. It’s a great time killer when you are bored. 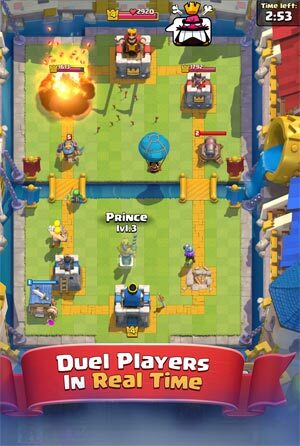 Clash Royale is owned by SuperCell, and the company made over 2 billion dollars in 2017! And over 800 million dollars in profit. It’s doing quite well for an app I’d say. I have been playing Clash Royale daily since it came out in early 2016. I am mostly a Free-to-Play (FTP) type player. But I will kick in a few bucks when guilt sets in. I’d say I’ve given SuperCell $10 – $15 thus far in guilt money. I am not trying to top the World Rankings, just looking for a fun way to pass the time. I’m in a clan, and I donate cards to the clan daily. I have mostly played the same deck (of 8 cards) the last two years, so I only request those same 8 cards in trades with my clannies. I save all my gold to level up those same 8 cards. I’m Level 12, and my rating is 4500. Only 3 of my cards are at max level. So, I consider myself an average, long-time, FTP player. About a month ago, something changed. SuperCell announced Clan Wars for Clash Royale. Day 1 is Collection Day. You battle with your own deck to earn a pool of cards for your clan. You get 3 battles on Collection Day. The goal is to collect as many Clan Cards as possible. Day 2 is War Day. You are put into a War against 4 other clans. Everyone in the clan has to make a deck from the pool of cards you have earned on Collection Day. The Clan with the most War Day victories wins the war. You get only 1 battle on War Day. Your only goal is to win this one 3-minute battle. Rewards! You gain Clan Trophies for doing well, and you progress through the Clan Leagues! At the end of every Clan War Season you’ll earn a War Chest. Your War Chest is based on your Clan League and the highest ranked war you participated in during the season. Achieve a better rank or higher league to earn a bigger chest! The tournament standard for Clash Royale is: Level 9 for Commons, Level 7 for Rares and Level 4 for Epics. Legendaries are tournament standard by unlocking them. This is fine for the Bronze League. Once your clan hit the Silver League, you need most your Commons to be Level 11, your Rares to be level 8-9, your Epics to be 5, and your Legendaries to be 2-3. This goes up even higher obviously for the Gold and Legendary Leagues. Oooh, sounds exciting doesn’t it? And it sort of is, until the Free-to-Play players hit a solid gold brick wall on Day 2 of War Day! The higher your clan move up in the leagues, the stronger your cards will need to be. Your cards have to be leveled up. And that requires cold hard cash! 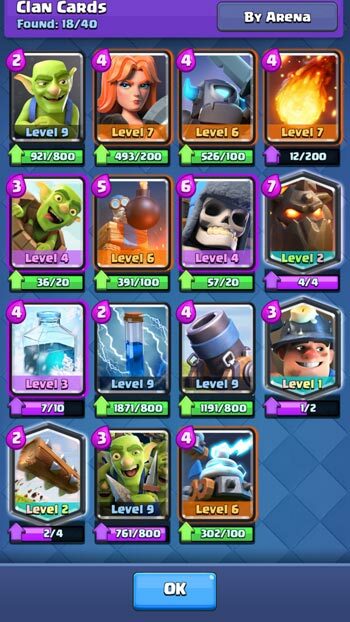 There are about 82 different cards in Clash Royale. You use 8 cards in your deck on a daily basis. During a Clan War, your clan earns about 20 different cards to use on Day 2’s War Day. The problem for casual players, is that you probably have only leveled up about up a handful of those 20 cards. The die-hards, the Money-To-Burn (MTB) players, will probably have most the cards at max level. Day 2 of Clan Wars Card Pool: Too many upgrades and not enough gold! That’s the Brilliance of SuperCell’s plan. You want to keep up with the Joneses, you better open up your wallet! This was smart on SuperCell’s part if they want to weed out the FTP’ers. I understand the people who have Money-To-Burn (MTB) paid a lot of money to SuperCell and should have an advantage over Free-to-Play’ers (FTP). I have no problems with that. It’s just that FTP players are really getting left in the dust in Clan Wars, and killing their clans during Wars. There is no way FTP players can be competitive above Bronze League on Day 2 of Clan Wars. You can assist on Day 1, helping your clan get cards. But on Day 2, you simply can’t build a competitive deck without spending gold you don’t have. I’ve posted a screenshot I took from a recent Day 2. I have 10,000 gold in my account. I have 10 cards that should be upgraded to War Level in this war. 10K will only let me upgrade one of the many cards I need to use, and then I’m broke. So I have to use several unevolved, limp cards during Day 2. Talk about feeling inadequate in a relationship! I totally feel like I’m hurting my Clan on Day 2. It’s frustrating and irritating. I simply don’t have the disposable income to fuel up 75 more cards to the next level. I don’t think a lot of people have those kinds of funds. I’m not going to buy gold to level up all those cards to be competitive during Day 2. I feel like this disparity is going to cause dissension amongst the ranks for Clans. Clans that have mixes of MTB players along with FTP players are going to be at odds with each other. MTB players will want to reach the Gold League with eyes on the Legendary League. FTP players are going to hold them back. I have a feeling that many clans will soon be kicking FTP players out. Or the MTB players will be moving into more professional type clans. And I think it’s really going to hurt casual play, and the overall player base, and break up long time clans. Of course, I could be way off on my opinion. Time will tell.